I rip babies from Mother's stomachs and send them for a 'proper' Upbringing. I am the Demon of State Interference in natural law. Is Latest Social Services Excesses Nazi philosophy by the Back Door? In The 21st Century the State feels free to imprison a mentally ill women, hold a secret court to force her into a cesaerian section so they can steal her baby and give it to a stranger who 'knows the right way to live'. Clare Ambrose's words (rightmost column) become prophecy. Forced C-section was ‘the stuff of nightmares’: Social Services condemned for forcibly removing unborn child from woman. The case of a woman whose baby daughter was forcibly removed from her womb by social services was described by human-rights groups on Sunday night as “the stuff of nightmares”. The Italian woman was sedated and her baby delivered against her will, after Essex social services obtained a court order in August 2012 for the birth “to be enforced by way of caesarean section”. The case, described by the woman’s lawyers as “unprecedented”, has further highlighted the controversial decisions made by the Court of Protection, which authorised the forced removal of the baby, as well as the powers afforded to social workers. The woman, who cannot be named for legal reasons, was visiting Britain in July last year to attend a Ryanair training course at Stansted airport in Essex when she suffered a panic attack after failing to take medication for her bipolar disorder. As more and more applications to take children into care are presented to the courts each year, the evidence of 'expert' witnesses is playing an increasingly important role in deciding who gets to keep their kids and who doesn't. This should worry all parents because it would appear from recent revelations that instead of producing unbiased results the 'experts' are using pseudo-science to confirm the line taken by the social services to justify lifting the child. Despite the professions continually harping on about how anyone other than themselves is unqualified to make these serious decisions, it's becoming obvious that social services don't apply the same requirements of suitable qualifications when the evidence they can get from unqualified “experts” suits their purpose. In this case – to take away your kids. Recent press coverage ( here ) shows that many people called to give evidence in child custody cases are not psychologists, or psychiatrists, yet are often asked to comment on mental health issues supposedly outside their area of expertise. Even when they do possess academic qualifications, they often no longer seeing patients as they're making enough money from being experts appearing in court. Why is this a worry? Because recent investigations have shown that many so called experts rely on out of date tests, some out of date by as much as 20 years, and some even make up their own tests. So much for peer reviewed science in the medical professions then. Some experts don't even go to see the people they're giving evidence against, something you would have thought vital to deciding what their mental health was like. It all seems very much like a 'witch-pricker' to enable Social Services to get their way. These 'experts' are getting well paid for it – on average £120 an hour – according to some reports. And this is public money that's being spent here. So What is a Qualified Professional? You'd think that using a GMC licensed psychiatrist to decide whether a parent's mental health was a threat to their child would be the solution. Enter Dr Hibbert. Hibbert is facing an investigation by the GMC after they refused his offer to surrender his license to practice medicine. Given that doctors accused of malpractice are often allowed to just hand in their license and quietly retire, or are sent for “retraining”, it is a measure of the seriousness of this case that the investigation is continuing. Or is it just that the press got to it first? Dr Hibbert stands accused of diagnosing serious mental illness in parents where none actually existed, including Bipolar Disorder and Personality Disorder, so that the social services departments that were paying him could proceed in their child care cases. Acting as their “hired gun” as one MP put it. Given the life long harm that a misdiagnosis of a serious mental health condition can bring to an individual's life, misdiagnosing so that their kids can be taken into care would be despicable. On the face of it, he has an impeccable background, lecturing at Oxford, and an advisor to the government on care assessment. So it will be interesting to see the outcome of the GMC investigations. Social Services Mafia Revealed! This shocking anonymous leaflet, first published in the late 1990s, can be seen on the net here. It will send a shiver down the spines of all parents everywhere. The history of child protection and family justice in England and Wales is completely unique in the world. The US, Australia, Canada and New Zealand have sometimes tried their hardest to emulate the scandals and blunders that take place in the UK - but have never managed to hit every single red button that the UK manages to hit with unerring accuracy! Dramatis tries to present that history through the mechanism of an index of individuals, upon which to anchor entries, sections, and even long essays. The site should be considered as a 'jumping-off' point for the visitor to employ for their own research. Click here to read Family Justice & Child Protection Dramatis Personae Index. ContactPoint is the countrywide database of all UK children (11 million of them!) which nearly 500 thousand teachers, health workers, social workers, police and council workers will have access to at the drop of a hat in 2009. The government's track record of securing digital information is absolutely appalling. In an age where private information is not properly protected. The Data Protection Act is an outmoded, superceded, toothless piece of inapplicable legislation which has totally failed to meet its original intention of protecting a person's privacy and identity. There is hardly any government agency which insists on the encryption of data, and those that do often farm-out the data to third party companies to process whose own security is so lapse as to be laughable. Hence it is a sine qua non that no digital data or information can be kept sacred or secure, yet government spokespersons (many of whom are themselves not computer literate) continue to tell the British public that it can. The risk to children and their families from ContactPoint is immense if this database gets into the hands of unscrupulous people. ContactPoint is a clear breach of family privacy for no good purpose. We've all heard of the high government officials who have not looked after their laptops only to have them stolen and effectively given the financial and other personal details of millions of people to a thief. During 2008 in Leeds, Yorkshire an 'unspecified' council worker (most probably one of those who will have access to ContactPoint) 'lost' a USB memory stick with over 5,000 children's names and details on it garnered from local nursery schools. The official public response to this loss was that the data was encrypted and therefore we should not worry. But were we ready to believe that? No! and quite rightly so because the memory stick had actually fallen down the back seat of a car which was subsequently sold on the second hand market and found there by the new owner who was able to just plug it in and harvest all the details, including that of his own daughter! The details of 5,000 kiddies was downloaded to a memory stick in seconds and then 'lost' by people in responsible positions who do not take sufficient care. And these are the ones we know about - how many more bits of data are being lost and covered up by incapable people like these? Or being stolen by paedphiles working within the police, local authorities, health professions etc., some of whom, inevitably, will have access to ContactPoint? ContactPoint was a response to the killing of Victoria Climbe in 2000. Remember that the SAFF have always maintained that the reason why Victoria Climbe died was because the social services were 'blind' to the incidence of abuse of children by erstwhile virtuous Christian fundamentalists and instead spent their time running after imagined satanists and evil-doers. Climbe was systematically beaten to death because her fundamentalist inspired guardians believed she was possessed by the devil and if social services had listend to what we have been trying to tell them for nearly two decades instead of attending so-called Satan Seminars then social workers would perhaps have diagnosed Victoria's position and saved her life. But what do WE know! The sad fact is that 8 years later and most social workers are still 'blind to the dangers of the self righteous'. and ContactPoint is unlikely to save any child from falling into the suffering that beset poor Victoria Climbe in 2000. See: GOVERNMENT'S STOBART REPORT STILL LEAVES CHILDREN IN DANGER FROM CHURCH EXORCISMS. There were angry burns stretching from her lower back down to the backs of her knees. She had to be given morphine to ease her distress. Concerned doctors questioned Adelle’s mother, 25-year-old Natalie, to try to ascertain what might have caused her injuries — which looked to them like scalds from hot liquid. But Natalie could offer no explanation other than that Adelle’s wet nappy had split during the night, four days earlier, and had covered the sleeping toddler with crystals contained within the absorbent padding. She was asked if she’d spilled boiling water on her child, used domestic cleaning wipes on her by mistake, or accidentally sat her on a kitchen counter covered with bleach. That evening, two social workers arrived at the hospital to further question Natalie, who was eight weeks pregnant with her third child, about these ‘unexplained’ injuries to her daughter. At 12.50am she was arrested on suspicion of grievous bodily harm and neglect, then held in a cell for 36 hours before being released on bail. Adelle and her brother, six-year-old Daniel, were taken into care, and social services warned Natalie that her unborn baby could be taken away from her at birth. ‘I just had time to kiss Adelle on the head before police officers marched me through the hospital like a criminal,’ says Natalie, whose partner of two years, Brendan Devine, a 23-year-old civil engineer, was also arrested. ‘They handcuffed Brendan, and the only reason they didn’t handcuff me was because I was pregnant. I was in pieces, absolutely terrified, thinking I might never see my children again. Natalie later discovered — to her horror — that doctors suspected Adelle had either been scalded in the shower or deliberately held down while scalding liquid was poured from a jug onto her lower back and legs. Until that night in May 2011, social services had had no involvement with Natalie — a full-time mother — or her family. Despite this, and with no evidence that she or her partner had deliberately hurt Adelle, the two of them were taken into custody, along with Natalie’s former partner, a legal assistant, who is father to both Adelle and Daniel. For eight months, Natalie had to live with the threat of criminal charges, her children being taken away from her permanently and her unborn baby being removed at birth. Finally, an independent burns expert concluded that Natalie had been right all along, and Adelle’s injuries had almost certainly been caused by urine-soaked chemicals in her burst nappy. Retired forensic burns consultant Colin Rayner reported that Adelle had sustained a ‘chemical injury to the skin’ caused by ‘lying for a prolonged period on a wet surface impregnated with a mildly noxious chemical’. Mr Rayner, former director of the Burns & Plastic Surgery Service for the West Midlands, added that there was anecdotal evidence that sodium polyacrylate — the gel-like water-absorbing chemical crystals used in disposable nappies — could cause skin reactions in some children. He said that Adelle’s injuries, despite their initial appearance, were ‘superficial’ and, unlike serious scald burns, had healed without blemish or significant scarring within two weeks. The police investigation was dropped, and in January — eight months after they were taken into care and two weeks after the birth of her son Kaiden — Natalie’s children were finally returned to her. ‘The nightmare may be over, but I don’t think we will ever fully recover from it,’ says Natalie in an exclusive interview with the Mail. 'I try to be truthful, but I don’t want him to know he could have been taken away and adopted. ‘But why did they have to take such drastic action without a more in-depth investigation? They had absolutely no evidence showing that Adelle’s injuries had been caused deliberately. Cuddling six-month-old Kaiden at her terrace home in Liverpool, Natalie recounts in chilling detail the Kafkaesque nightmare in which she found herself. It was around 8am on Thursday May 26, 2011, that Natalie and Brendan woke to find that Adelle’s very wet nappy had split during the night and urine-soaked crystals had leaked down her legs. Usually Natalie bought Pampers nappies, but she’d just changed to a supermarket own brand to save money. My profession is childcare; I strongly believe that all children should grow up in the knowledge that they are loved, have all their basic needs such as food, warmth, shelter and know they are safe and secure. There is a new process now which has changed the words "Child Protection" into what we now name "Safeguarding children". This has opened up a new powerful approach to how children are looked after and protected by the legislation that covers those professionals responsible for child welfare - but has it really gone deep enough behind the scenes to ensure it stretches to all children? In order to fully understand where we are at in today's society with regard to safeguarding our children you need to be up to date on the past events of the scandal made by social workers in 1990. On Wednesday 11th January 2006 a BBC TV documentary 'When Satan Came To Town', revealed the horrors and agonies of the 20 children in 1990 who were snatched from their homes in dawn raids in Langley and taken into care by Rochdale Council, following allegations of 'satanic abuse'. In a statement, Rochdale council said: "[We have] both acknowledged and apologised for the errors made in the investigation of the allegations in the 1991 case." Due to misinformation they caused the children in total to spend 34 years and four months in care. The children involved and their families went through absolute hell and irreparable torture due to social services playing God with their lives. "IN THE weeks following the dawn raids, and with the growing realisation that some terrible mistake had been made, the question that local people and the Middleton councillors wanted answering was what prompted the "witch hunt"? The root cause seems to have been a series of social workers' conferences given by a group of, what were later labelled by media investigators, as "fundamentalist Christian evangelists" from the United States. Delegates returned from the conferences to scan their files for any indications of satanic or ritual abuse among their "clients". Two Middleton social workers did not have long to wait before their fears were aroused. In March 1990 a four-year-old boy's behaviour concerned teachers at a Langley primary school. He and his two elder brothers and sister were questioned by the social workers. Allegedly flawed interview techniques, taught at the conferences, led to the youngest boy describing being present at ritual sacrifices of babies and seeing satanic cult members robbing graves in a Middleton cemetery. The boy's father, Andrew, who still lives on Langley, said people would be shocked when they heard transcripts of the interviews in the BBC documentary. The "confession" prompted Rochdale Council to take the three boys and girls into protective care. But it didn't stop there for social workers feared that their school friends might also have been involved and at risk. This resulted in a co-ordinated series of dawn raids by teams of police and social workers on homes in Langley. Distressed parents looked on helpless as a total of 21 children were "snatched" and taken into care to be farmed out to foster homes. It was to be six years or more before the bulk of them were reunited with their families. The Middleton social workers were not the only ones influenced by the American "missionaries". Similar cases were misdiagnosed in Cleveland, the Orkney Islands, Newcastle, Nottingham and Pembroke. All this apparent hysteria prompted the Government to commission a study by Professor J. S. La Fontaine ( THE EXTENT AND NATURE OF ORGANISED AND RITUAL ABUSE (Prof. J LaFontaine) 1994: ISBN 0113217978 H.M.S.O. ) . She found that no evidence of satanic ritual had been found. Rumours and accusations of such abuse had been progressed on the basis of dubious information. She said some evangelical Christians, psychologists, child-care workers and health-care professionals were responsible for spreading the myth. Her report influenced the then Health Minister, Virginia Bottomley to order that every social worker in the UK be retrained with the proper techniques for interviewing children and that the "outrageous and traumatic" practice of taking children from their homes in dawn raids should be ended." The SAFF (Sub-cultures Freedom Foundation) was instrumental in trying to help the families involved. They wrote to police, social workers, the Home Office, MPs, in a massive campaign to show there was no proof of ritual abuse and that it was all scaremongering. It was the SAFF which first highlighted the fact that the NSPCC had been accepting discredited information on the satanic child abuse scare from various groups. Now in 2008 the Safeguarding Children courses being sent out by authorities to a lot of childcare providers and professionals are written by and mostly run by the NSPCC. .
"imposing expectations that are inappropriate to the age or development of the child-e.g. over-protecting the child, limiting their exploration and learning, preventing them from taking part in normal social interaction." "Seeing or hearing the ill-treatment of someone else." All the statements above could include most things you as parents may do, from restricting your children to play at a friend's house for earlier bad behaviour, to the child watching someone being ill treated in Coronation Street on TV. Basically normal good parenting and over protection from danger can result in abuse. The world has gone insane and this is still the new information on child safety being taught to professionals who deal with our children. It is as though the obsessive social workers who were pre-convinced about the existence of a (fictional) world-wide conspiracy of Satanists have transferred their hysterical scaremongering into claims about ordinary child-care. Suspicions and mofits which were current during the SRAM have been re-packaged to encompass any ordinary family whom social workers dislike or distrust. Now don't get me wrong of course as parents and professionals the safety of the children in our care is paramount and there is abuse going on out there that we need to be aware of and immediately act upon,but this next piece will make you very aware that misinformation is still ripping families apart. "the number of babies under one month old being taken into care for adoption is now running at almost four a day (a 300 per cent increase over a decade). In total, 75 children of all ages are being removed from their parents every week before being handed over to new families. Some of these may have been willingly given up for adoption, but critics of the Government's policy are convinced that the vast majority are taken by force. Time and again, the mothers say they are innocent of any wrongdoing. Of course, there are people who are not fit to be parents and it is the duty of any responsible State to protect their children." "But over the five years since I began investigating the scandal of forced adoptions, I have found a deeply secretive system which is too often biased against basically decent families. I have been told of routine dishonesty by social workers and questionable evidence given by doctors which has wrongly condemned mothers. Meanwhile, millions of pounds of taxpayers' money have been given to councils to encourage them to meet high Government targets on child adoptions. Under New Labour policy, Tony Blair changed targets in 2000 to raise the number of children being adopted by 50 per cent to 5,400 a year. The annual tally has now reached almost 4,000 in England and Wales - four times higher than in France, which has a similar-sized population. Blair promised millions of pounds to councils that achieved the targets and some have already received more than two million pounds GBP (2,000.000.00) each in rewards for successful adoptions. Figures recently released by the Department for Local Government and Community Cohesion show that two councils - Essex and Kent - were offered bonuses of more than 2 million pounds GBP (2,000.000.00) over three years to encourage additional adoptions. Four others - Norfolk, Gloucestershire, Cheshire and Hampshire - were promised an extra one million pounds GBP (1,000.000.00). This sweeping shake-up was designed for all the right reasons: to get difficult-to-place older children in care homes allocated to new parents. But the reforms didn't work. Encouraged by the promise of extra cash, social workers began to earmark babies and cute toddlers who were most easy to place in adoptive homes, leaving the more difficult to-place older children in care. As a result, the number of over-sevens adopted has plummeted by half. Critics - including family solicitors, MPs and midwives as well as the wronged families - report cases where young children are selected, even before birth, by social workers in order to win the bonuses. More chillingly, parents have been told by social workers they must lose their children because, at some time in the future, they might abuse them. One mother's son was adopted on the grounds that there was a chance she might shout at him when he was older. What's more, the obsessive secrecy of the system means that the public only occasionally gets an inkling of the human tragedy now unfolding across the country. For at the heart of this adoption system is the family courts, whose hearings are conducted behind closed doors in order to protect the identity of the children involved. Yet this secrecy threatens the centuries-old tradition of Britain's legal system - the principle that people are innocent until proven guilty beyond all reasonable doubt. From the moment a mother is first accused of being incapable as a parent - a decision nearly always made by a social worker or doctor - the system is pitted against her. There are no juries in family courts, only a lone judge or trio of magistrates who make decisions based on the balance of probability. Crucially, the courts' culture of secrecy means that if a social worker lies or fabricates notes or a medical expert giving evidence makes a mistake, no one finds out and there is no retribution. From the time a child is named on a social services care order until the day they are adopted, the parents are breaking the law - a crime punishable by imprisonment - if they tell anyone what is happening to their family. Anything from a chat with a neighbour to a letter sent to a friend can land them in jail. And many have found themselves sent to prison for breaching court orders by talking about their case. As High Court judge Mr Justice Munby told MPs last year: "It seems quite indefensible that there should be no access by the media, and no access by the public, to what is going on in courts where judges are, day by day, taking people's children away." However, it is not only secretive and publicly unscrutinised family courts that are creating an injustice in our adoption system. Such patients could include mothers with post-natal depression, heavy drinkers or anyone with a ‘chaotic’ personal life. It is the first time the GMC has told doctors to raise the alarm if they suspect adult patients are potential abusers. Previous guidance focused on symptoms of abuse in the victim. It follows the tragic case of ‘Baby P’ Peter Connelly, who died in 2007 in his north London home after months of abuse by his mother, her boyfriend and their lodger. He had been seen by dozens of medical professionals and social workers. SAFF SAYS: More GMC lies. The Baby P child murder was not caused because the family's doctor was short of evidence. Repetitive abuse was ENDEMIC in this Baby P case. It didn't need a GP to check on the medical history of the parents because the child was injured dozens of times in ways which were glaringly obvious. There were in fact over 60 visits to the family by social services, doctors, and police whilst Baby P died suffering in the background. It is typical that the GMC would try to protect the interests of the medical profession by turning what should have been outright condemnation of the lack of professionalism of health workers in the Baby P case into a grab for more power for doctors to blame it on innocent parents; the GMC obviously do not know what the word 'shame' means. There is a more worrying factor involved. Look at the official figures. Why are they so high? Is it really true that more mothers are becoming potential killers or abusers? Or are the financial bonuses offered to councils fuelling the astonishing rise in forced adoptions? John Hemming, a Liberal Democrat MP campaigning to change the adoption system, said yesterday: "I have evidence that 1,000 children are wrongly being seized from their birth parents each year even though they have not been harmed in any way. The targets are dangerous and lead to social workers being over-eager. The system's secrecy hides any wrongdoing. One has to ask if a mother is expected to have problems looking after her baby, why doesn't the State help her instead of taking her child away? Babies are being removed from their mothers by social workers using any excuse. We strongly suspect this is because newborns and toddlers are more easily found homes than older children. They are a marketable commodity. I know of social workers making up stories about innocent mothers simply to ensure their babies are put up for adoption. Suitable babies are even being earmarked when they are still in the womb. One baby was forcibly removed in the maternity ward by social workers before the mother had even finished the birth process and produced the placenta." Her words may be emotive. But are they true? Six months ago, I wrote an article about a young couple - who must remain anonymous because of family court law - fighting for the return of their three-year-old daughter. She was taken within weeks of birth and is about to be adopted. Astonishingly, a judge has issued a Draconian order gagging them from revealing anything, to anyone at all, which could identify their daughter until her 18th birthday in 2022. Immediately after the article was published, I heard from 35 families whose children were forcibly removed. The letters and e-mails continue to arrive - coming from a wide range of families across the social classes (including from a castle in the heart of England). An e-mail from one father said: "Please, please help, NOW. We are about to lose our son . . . in court tomorrow for final disposals hearing before he is taken for adoption ... we have done nothing wrong." Another father calling himself "James" rang to say his wife's baby was one of eight seized by social workers from hospital maternity units in one small part of North-East England during one fortnight last summer. A Welsh man complained that his grandson of three weeks was earmarked for forcible adoption by social workers. The mother, a 21-year-old with a mild learning disorder, was told she might, just might, get post-natal depression and neglect her son. To her great distress, her baby was put in the care of Monmouthshire social services within minutes of birth." This fanaticism of the Child Care Industry is a direct result of the hysteria surrounding the Satanic Ritual Abuse Myth (SRAM), Because of the work of the SAFF in exposing and ridiculing social workers over their imagined fears about SRAM they have moved on from the religious ruse to that of using the Emotional Abuse reasoning in order to remove children from their homes without proof. The courts which operate utterly in secret are completely unjust and have no accountability whatsoever to normal rules of law, enabling them to ride roughshod over the rights of the parents and children whom they take exception to. That the government has backed these new laws and that all parents are now at risk because if the Rochdale and Orkney scandals occurred again today, then it would be illegal for any person to comment on them publicly - including the parents who have been accused and their offspring. Thus the entire victimisation can occur without any of the normal rules of evidential law, without appeal, and often without representation, going on the testimony of people who may be religiously or ideologically opposed to the parents lifestyle and the victims have absolutely no redress in English law. "Emotional abuse" has no strict definition in British law. Yet it now accounts for an astounding 21 per cent of all children registered as needing protection, up from 14 per cent in 1997. Last year 6,700 children were put on the child protection register for emotional abuse, compared with only 2,600 for sexual abuse and 5,100 for physical abuse. Both of the latter two categories have been falling steadily. Meanwhile emotional abuse and "neglect" - which replaced the old notion of "grave concern" in 1989 - have been rising. Both are catch-alls. But emotional abuse is especially vague. It covers children who have not been injured, have not complained, and do not come under "emotional neglect". Do you as a reader of this piece and a parent and/or childcare professional find this frightening? You should. does not incorporate ambiguities which enable innocent people to be roped into a witch-hunt by over-zealous social workers and do-gooders. How would you feel if your children were taken away in a dawn raid? You could not appeal, speak about it, see your children and maybe they would be put up for adoption never to be seen or heard of again. WHAT WOULD YOU DO? At present nothing because you and your children have no rights and the secret courts hold all the counters. Now where exactly do you think all this leaves families having unorthodox religious backgrounds that are widely misunderstood or even regularly vilified in our establishment? Who are they going to turn to for help? Remember that SRAM can very affect YOU! If the secret courts are given misinformation about you they are not pulled up, not asked to give proof but BELIEVED IN ORDER THAT YOUR CHILDREN ARE REMOVED FROM YOUR CARE. Just look at the definitions of Emotional Abuse and think about how many families it could touch that you know. The NSPCC document on the effects of child abuse state behavioural problems, educational problems, mental health problems and relationship difficulties amongst others. Now get an over zealous social worker and they could use those definitions against ANY family including yours and haul them into the secret court system before you even realise what is happening. Children need to be safeguarded as they are vulnerable to the system that is there in place to protect them-but it needs to be the right system. Secrecy cannot replace the term confidentiality. From secrecy and deceit spread lies and those lies and misinterpretation are today still ruining people's lives. We need to spread the word and make others aware. As you see from my earlier piece above, and the cases in the column on the left, we now live in very worrying times for parents regarding the safety of our children. There are so many different types of childcare from privately-run pre-schools, day nurseries, schools, childminders, and community-run childcare with trustees overseeing them. All these are 'responsible' for the safety of our children, but how many of them are simply government controlled nosey-parkers? Are they all being managed correctly or are some of them snipe-nosed bigots who want to victimise people whose lifestyle they don't agree with? Do the people in overall control fully understand the responsibility they hold? It is always the headline cases (for example, the case mentioned above ‘Little Ted’s Nursery’) which seem to shape developments and future guidelines. In other words knee-jerk reactions to pacify the media and the outraged public appear to come before common-sense and experience from those who actually look after children. There are professionals whose main aim is the safeguarding of children, but the procedures they are given to follow do have flaws. For instance, school policies are only good if the Governing Body are worthy of carrying them out and willing to criticize those who put them into place. In some cases the Governing Body of a school carries more clout than the Local Authority Designated Officer (LADO), Police and Social Care. Although these bodies can advise a school, the school’s Governors and Headteacher have the last say in certain cases. The Safeguarding regulations to be followed by schools need to include more influence from the authorities. They are a law unto themselves and often misuse the rules in order to escape blame. For example, in a recent case in which I was personally involved a LADO Officer excused her inability to act by telling the parents of a child who said he had been physically abused by one of the teachers that she was a ‘toothless tiger’ with little power to intervene. To avert blame from the school the Headteacher later made up retrospective claims of abusive language from the parents, trying to portray them as violent troublemakers. This was later completely dismissed as being untrue, but it served the school’s purpose well. The regulations with Early Years providers are met in a different way and providers in this area of childcare are more accountable for their actions. Ofsted is seen as a regulatory body, however when you are dealing with them they don’t always reply and can take 6 months or more to act on important issues. Complaints against Schools are strangely passed over to yet another body, then another, until some parents give up on their complaints. The result is that the system misses chances to improve. The Mail Online still puts forward concerns in March 2012 that all is not as it seems. Family cases aired in the Family Court System are failing due to the bias of so-called experts called in to give evidence. This system needs a complete immediate overhaul. Families lives and futures are at the hands of these ‘experts’ that are called in to find and give evidence against them in court. The regulations these experts need to meet obviously requires changing. A report in February 2012 by Professor Jane L. Ireland, PhD [see here] does give recommendations for change; let us hope these recommendations are taken seriously. "One could ask what encourages a psychologist to become involved in such work. Some will undoubtedly do it out of a desire to protect children. However, it is clear that a career and a living can be made from such work. On average. experts charge £120 an hour for assessing families and compiling reports. So this is a well-paid profession with tariffs set far higher than for many psychologists working in a full psychological practice. A complex two-parent assessment for a court case could easily bring in more than £4,000, as a minimum. In our study, one expert laid claim to writing more than 200 reports in the past year, while another put on their CV that they had completed ‘over 1,000 reports’". There should be a set number of reports per year an ‘expert’ can legally author, to put a stop to them financing their lives by using incorrect data to mark the misery of others. The Parent Practice talking on the Vanessa Feltz's show (BBC London) on 18th May about how she feels that the new government CANparent initiative (parenting classes voucher scheme) makes parenting classes more accessible and more mainstream and hopefully goes some way to counteract the negative image surrounding parenting classes. Here's the Prophecy and Mark it Well: Beware your relaxed lifestyle. Before long you won't be allowed to have kids if you smoke, drink, are overweight, don't eat 5 different types of greens a day and believe in something the inquisitors of the state think is unacceptable. And, as usual, this assault on the natural law rights of parents and children is not just happening in Britain, Like the Satan Scare, it first happened in the U.S. and has been imported into the U.K. by the power-hungry and bigoted leaders of the Child Scare Industry who enjoy influence and riches beyond measure by persecuting dysfunctional families who have no means of fighting back. child abuse. As a result, their homes were invaded by bureaucrats; dossiers were opened on them; their names were put in central computers, permanently on file; their children were asked leading questions and encouraged to inform on them. These were the lucky ones. The less fortunate ended up losing their life savings, their home, their children... everything. Canada. A network of federal, state, and local agencies is snatching children right out from under their parents' noses. 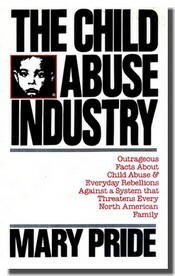 This is the child abuse industry, and every year it threatens more and more families. • It defines "abuse" so vaguely that all families are "guilty"
home if they cooperate and undergo "therapy"
These are just a few of the shocking facts Mary Pride has uncovered in this eye-opening study. If you are a parent, you owe it to yourself-and your childrento read this book and find out how you can protect your family from the child abuse industry. Before it's too late. Mary Pride, Advises on what you can do to avoid being 'dobbed' by hateful people and you can really feel the oppression we are all now under in her recommendations. Your children are not safe in your home, and never will be until the laws are changed. However, there are some things you can do to make your family less vulnerable, and some actions you can take to defend yourself if you are falsely accused of child abuse or neglect. Any family can be hotlined by an anonymous accuser. Your personal chances of getting hotlined, however, are decreased if you take care to cultivate friendly relations with others. Fighting with the neighbors is one of the best ways to invite a nasty hotline call. On the other hand, those who try to "do unto others as you would have them do unto you," who mow the grass of the widow lady next door and help out when others need help, are much less likely to be hotlined. Avoid isolation. Reach out and make a few friends. Join neighbourhood associations etc. Families who are unknown and isolated are prime targets. Try to dress your children nicely whenever you go out in public - but not too nicely. Also, impress on them the importance of politeness and quiet good manners. Loud, rowdy kids irritate people, and irritated people make hotline calls. Buy a portable cassette recorder and a good supply of cassettes and batteries. You will need it if you are ever investigated. A video camera, for those who can afford it, is a good thing to have around the house. If your child is injured, take him to your own private doctor if at all possible. Emergency room personnel are trained to be oversuspicious of child abuse, in all child injury cases. Line up a good attorney before you are ever hotlined. You want one 'who will fight for your rights, not one who undermines you. Contact pro-family groups in your state for leads on which attorneys have a good record of winning child abuse cases. Get the names of several attorneys, if possible, so if one is on vacation or otherwise unavailable when you need him, you have a backup. Of course, the best defense is a good offense. Join with others in changing the child abuse laws, and you will have the best support network around. The social worker is at the door. Now what? First, make sure the person at your door is a child protective services worker. Ask for identification, then excuse yourself, go to the telephone, and call the county office of child protective services to verify that a worker has been dispatched to investigate you. Do not open the door; tape-record the exchange between you and the worker. You have a right to make sure that an impostor is not attempting to gain access to your children. Next, call your lawyer. It he's not willing to hurry over to your house to be there at the interview, call another. If your husband is not home, call him home. If you have relatives in town, ask them to come over. If you have time, call a few friends and neighbors and collect them as witnesses to what happens next. Now, take the tape recorder and go back to the door. In some , states it appears that policemen are allowed to break your door down and take your children; in others they aren't, but a policeman or social worker may threaten to nonetheless. Try to keep things cool. Tell the worker that she can see the children through the screen door to see .that they are O.K.. and that you will be glad to make an appointment with her at her office at some convenient time. construed as evidence against you, no matter how innocent. What you want to find out is what you are accused of, so you can disprove the charge. You do not want to give a social worker the opportunity to snoop around your house inventing new charges. Obviously, if a policeman breaks down your front door and snatches your children, you can't do much about this. But if the social worker is alone, she can't take your children. So be polite; don't panic; negotiate; and try to assemble your witnesses. guilty. The first step is to have the children thoroughly examined by your private physician, no matter what the charge. 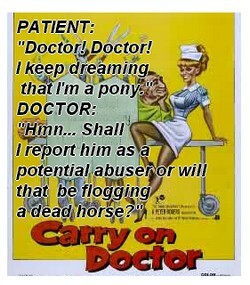 Charges of phys'ical or emotional abuse can easily turn Into Charges of sexual abuse once state doctors get their hands on your children. Document everything. If the social worker acted rudely or strangely, report this at once in writing to the head of the division in your state. jthought of meddling with you. Be polite, but relentless.I heard of one mother who, threatened with losing her newborn, ran screaming through the maternity ward, "They're stealing my baby!" She got the baby back. Although the screaming-in-the-halls method is not choice number one, that mother put her finger on the message you'll want to convey: "They're stealing my children!" You can purchase Mary Pride's book on line at Amazon.com (here) . It makes shocking reading and is a key to what the Child Scare Industry has been doing for the past twenty years, inculcating it's way into power and hoisting politicians and the judiciary over a barrel so it can do its worst. Critics may say that Mary Pride is just another radicalised alternative type with a political axe to grind, but in fact she is a committed Christian and part of the Pro-Family movement. She has no other intention than to protect the natural law rights of parents and children against the iron-fisted actions of social services. The catalogue of errors that let Baby P fall through society's safety nets has reopened the debate on ContactPoint, the controversial computer database that is set to hold details of all eleven million children in England (Eye 1219) and is due to go live in parts of the country next month. ContactPoint was the government's answer to the horrific murder in 2000 of eight-year-old Victoria Climbie, who -like Baby P - died on Haringey council's watch. Its aim is to make it easier for those involved with children to share concerns and information about their welfare. Amid recent hand-wringing, however, little was made of the government's track record in "losing" confidential data or the risks posed to children by having their addresses, schools and other sensitive data available to tens of thousands of public sector workers. The Eye has already reported concerns over plans to allow 330,000 people access to the database. But it seems the Department for Children, Schools and Families (DCSF) has been understating the numbers of council, health, schools, courts and police staff who will have access. Hidden in written answers in parliament two weeks ago was the news that the figure could be as high as 480,000.